Sony Ericsson T707 runs the flash-based Media Center. Its menu lists the Photo, Music, Video, Games, RSS feeds and Settings icons. The Photo gallery stores the shots you've taken along with the prebundled wallpapers. Autorotation is unfortunately not available, but you can still rotate images to landscape orientation. Images are generally displayed as a 3 x 4 grid of thumbs. The shots in the dedicated Camera Album are sorted by the date they were taken on. Opening an image makes the thumb zoom in to fullscreen view mode, while exiting the fullscreen view smoothly zooms out to thumb view. Sony Ericsson T707 doesn't sport an inbuilt GPS receiver, but it can still geotag camera images by triangulating your position using network cells information. If you pair it to an external Bluetooth GPS receiver, it will use it to geotag the image more precisely. No matter whether you use Cell-ID or real GPS geotagging, you still get the View on map option in the image gallery. It allows you to check the place where the shot has been taken directly on the map using the preinstalled Google Maps application (data charges may apply). The music player to be found in Sony Ericsson T707 is version 3.0 - a slightly abridged edition of Walkman player 3.0. The player supports numerous file formats plus the MegaBass equalizer preset and Stereo widening. The music player can naturally be set to run in the background. The video player in the Media center supports fast-forwarding and rewinding, and the interface is simple and stylish. The video files are accessible via the file manager too. The video section also houses the pre-installed YouTube client. It gives you full access to clips and uploading, bookmarked favorites and so on. The integrated FM radio of Sony Ericsson T707 has memory for 20 stations and supports RDS. It has a nice interface and makes great use of the TrackID music recognition service. The radio can be minimized in the background much like the music player but offers none of the fancy fullscreen graphics. The TrackID functionality is the same we know devices like the Sony Ericsson C903. The audio quality of Sony Ericsson T707 bears the typical for the company mid-range handsets traits. Much like the Sony Ericsson W595 it offers excellent scores on most readings and a disastrous frequency response. 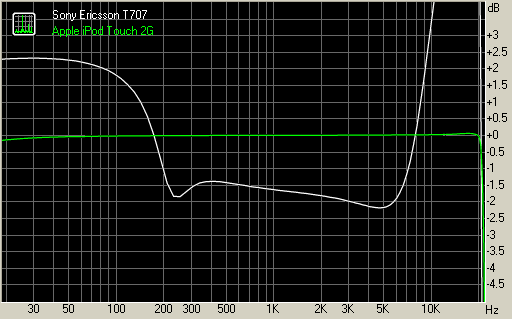 The frequency response deviates severely from the textbook rules. It has extremely boosted bass and treble and reduced mid frequency sounds. The graph looks as if an equalizer has been applied only that it wasn't. We can hardly imagine how far off the frequency response would be if you actually apply one. On the positive side all of the other readings are pretty good with the distortion levels simply great. The stereo crosstalk, the noise level and the dynamic range are also nothing short of excellent. You can see for yourselves that save for the frequency response the Sony Ericsson T707 is quite a gifted musician. You can also notice its resemblance to some of the other Sony Ericsson handsets we have tested recently. You can find more info about the testing procedure and more results here.